Embrilliance embroidery software for Mac and PC. » An Early Holiday Present for you! An Early Holiday Present for you! For our Embrilliance family of makers, we present a gift to commemorate the holiday season. We give you this beautiful (yet quick stitching) embroidery design, so that you can create something your family, friends, or even the customers at your next craft sale, will remember for a lifetime. 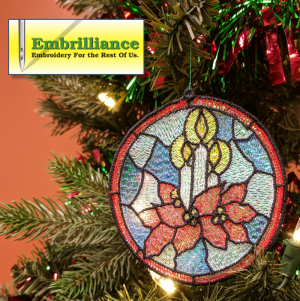 Our classic stained-glass ornament design is sized to stitch on almost any embroidery machine. Whether in the light or at night, this bauble is sure to brighten any room. We’ve included a PDF with complete, step-by-step instructions for stitching and finishing the ornament in the above zipped file. All you’ll need is a small square of mylar material, some fibrous water-soluble stabilizer, and your favorite embroidery thread to create this wonderfully dynamic piece for your tree, garland, or holiday display. It would even make a wonderful decoration to a holiday gift basket or thoughtful hostess gift for upcoming parties and gatherings. Dress up a bottle of wine, bag of coffee beans, gourmet cookie mix or embroidered towel/apron. Make this holiday one filled with sparkle-y embroidery! For those that have Embrilliance StitchArtist, you can view all of the objects with their stitch properties by going to Create mode! 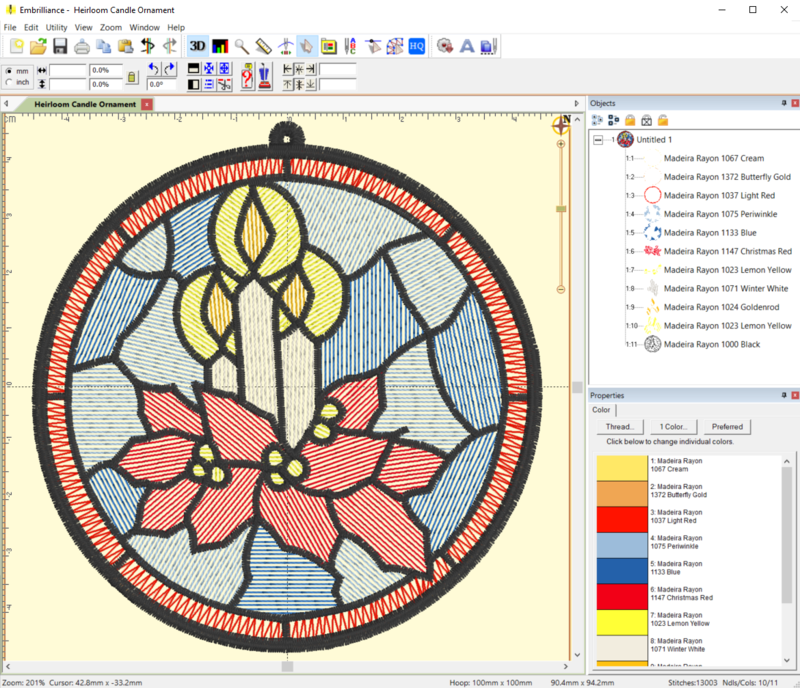 Use this beautiful embroidery design working file as inspiration and guidance to create your own stained glass mylar embroidery designs. Happy Holidays! Posted 5 months ago at 11:59 am.